Palmia Observatory: Never to be seen stars; Angular momentum and selection rules; Bell entanglement test with quasars; Using lasers to shrink accelerators; Is quantum mechanics real? Never to be seen stars; Angular momentum and selection rules; Bell entanglement test with quasars; Using lasers to shrink accelerators; Is quantum mechanics real? Well we had hoped to get in some dark sky observing this week, but the stormy weather put an end to that, but we have some review comments on three physics lectures that we attended. But first, we were sad to have been clouded out of our nightscape photography class in Borrego Springs which would have discussed techniques of combining natural landscapes, or the sculptures in the area, with nighttime stars in the background. We had hoped to get some great pictures like the one shown below, but the rain cancelled all of those events. 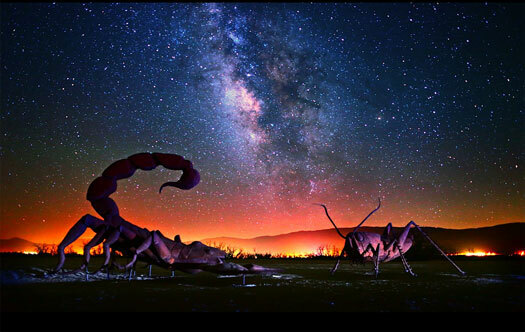 Since we were getting ready to go to Borrego Springs, I hadn't followed up on my Smithsonian magazine reading, but luckily, Big Oil Chemist, Dr. Arnold, forwarded an article on four types of stars that no matter what we will never see. These stars are the end result of the continuing evolution of the normal type stars we see around us today, but their development processes would take so long, many more billions or trillions of years, that we and even the Earth will be long gone by the time these natural processes are finished. So we get used to thinking about astronomy as looking back into the past, with events which happened millions and billions of years ago. Here we see that there are processes going on in stars today that will not be completed for billions of years. These processes are not the standard ones of stellar evolution, where stars enter the Main Sequence and evolve, but it goes much further in the future. 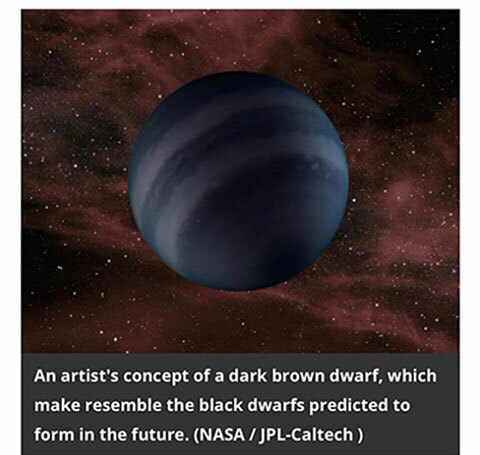 It is kind of like looking so far into the future that we begin to see the eventual heat death of the universe. Cool! Thanks for reminding me and us about the stars, Arnold! We should also report on one of those "Aha" or "Eureka" moments, much like those that you have also experienced. I finally recognized and understood one of those physics principles that many physicist wannabes would have picked up and learned in the sophomore or junior year, but in my case didn't quite understand the concept until now. Better late than never, I suppose, but I had never quite grasped where the quantum mechanics selection rules, those rules which tell, for instance, how an excited atom can emit a photon and return to a lower energy state, come from. 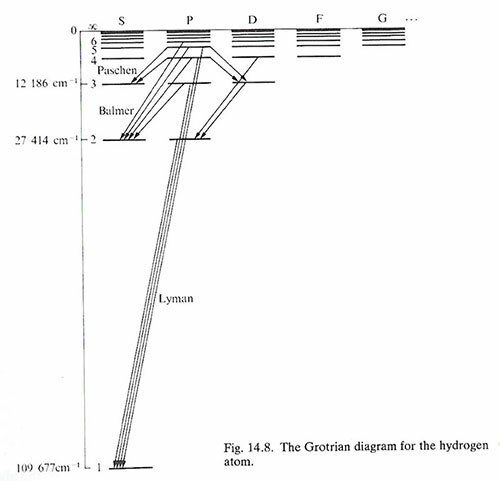 Remember that the emission outlined in the diagram below, that the atom emits a photon from one of the excited orbitals, "SPDF or G" by just transitioning to one of the lower levels. The selection rule says that the change in the orbital can only differ by one. For instance, the transition from the P orbital, back to the S orbital is allowed and this results in a photon emitted in the Paschen, Balmer or Lyman emission lines. Now, I had seen this kind of diagram many times before, but never did I recognize that the selection rules comes directly as a result of conservation of angular momentum. The angular momentum change in the orbital transitions must be equal and opposite to the angular momentum of the emitted photon. Yes, photons, although considered massless, carry angular momentum. So, for any other transition, such as D to S, this is not allowed because the angular momentum change would be two units and photons are emitted singly, each with other one unit of angular momentum. So the selection rules are derived and found to apply because of the conservation of angular momentum. Now another surprise to me, along these same lines of thought and conservation of angular momentum, is illustrated in the diagram below, which considers the rearrangement of internal molecular orbitals that differ by two units of angular momentum. Now since, Raman transitions, involve two photons, it is possible to still conserve angular momentum. The Raman transition starts with an incident photon of one frequency and the rejection of a photon of slightly different frequency. The frequency difference is important in spectroscopy, but for angular momentum considerations we see that the transition occurs because the two units of photon angular momentum exactly cancels the change of internal orbital angular momentum. So momentum is conserved and the process can occur naturally. Pretty neat! Ok, back to the physics colloquium lectures. 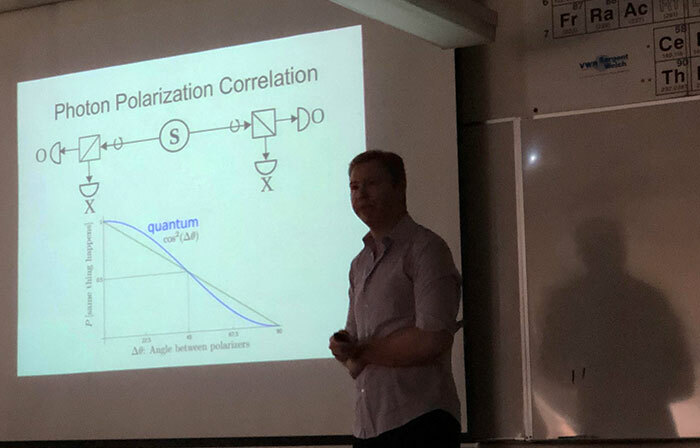 The first one by Professor Jason Gallicchio, Harvey Mudd College, discussed on his team efforts to perform a Bell entanglement test using light from distant quasars to close one of the loopholes. 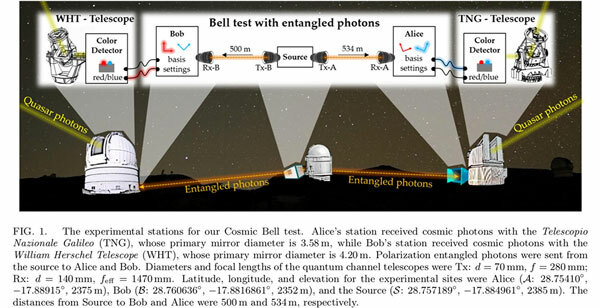 He started with a discussion of the Bell test using entangled photons from the source, S, and two observers, usually identified as Alice and Bob, then perform measurements on the photon which is directed towards their respective laboratories. It turns out that irrespective of what type of polarizer used in their laboratory, there is a spooky correlation that is observed later as they compare notes and statistics about their measurements. As indicated by the "blue" curve in the slide image below, the correlation predicted by quantum mechanics logic is different than the "straight line" predicted by normal everyday logic. Why does this happen? It is just the way that quantum mechanics description of the world tells us to do the calculations and physicists and others have been struggling for year now, with various alternative perspectives about why the world works like that, but the fact remains that quantum mechanics is the best explanation so far. But, scientists who examine and think about these strange results speculated that there might be some strange correlation between the way the random selection of polarizing filers was selected. 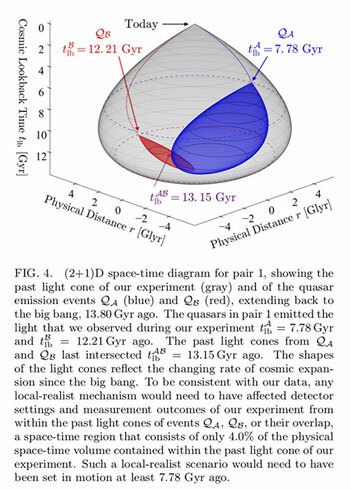 So, Jason's test was to use light from two distant quasars, which are so far apart that they had no common causal connection during the previous several billions of years. This light was used to select one type of polarizer, out of several possible, in their lab setup. This arrangement was thought to remove the small possibility that some event in our everyday life now was actually responsible for causing the statistical correlation between laboratory measurements. To me, hardly anyone really thought that this was happening, but with quantum mechanics being so weird, even if spectacularly successful, and without any better explanation, this experiment had to be done. So, the slide below, taken from one of the collaboration's papers, you can see the general setup where the entangled source sends each of the observatories, one of the entangled particles. Then each observatory, detects the light from its assigned distant quasar, and based on the light's color, selects which polarizer to use in making its measurement of the received entangled partner. Hmm, all of these observatories are located in the Canary Islands, and maybe we should look at travelling there just for the fun of it and touring around! Ok, ok, back to the physics from the daydream! Now, let's look at the spacetime distance between the two selected quasars. 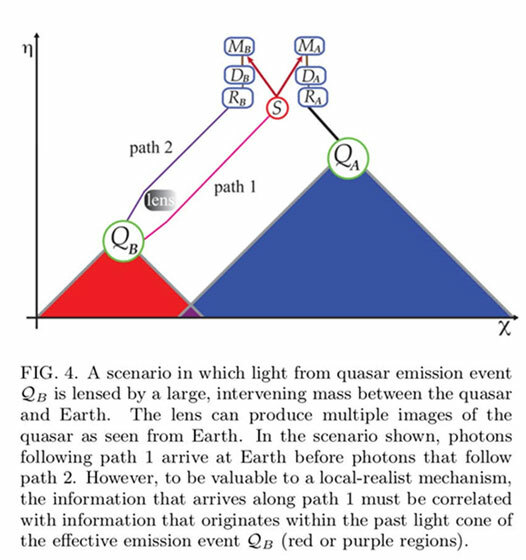 So, in the spacetime diagram below you can see the only possible causal connected between the selection of which polarizer, Db and Da, would be selected, is pushed way back in the past, represented by the shaded region covered by both red and blue light cones. Now one complication to the simple linear light cone example shown previously is that it doesn't take into account effects like the expansion of the universe. Not that it makes the quasar test in error, but only that the distances to the quasars are not as severe as shown in the linear case. The diagram below shows how the distances to those two quasars is corrected for the effects of universe expansion. Wow, that was pretty neat and I had not considered that the expansion would have to be taken into account! Anyway, to get right to the conclusion of the experiment outline by Jason, his team found that the predictions of quantum mechanics were still verified so that the loophole of some unknown common causal connection between the random selection of polarizers in each laboratory was the cause of the spooky correlation. But, no, quantum mechanics is verified again; just like most of the physics community expected! The second lecture was given by UCI professor Franklin Dollar as part of the UCI Physical Sciences Breakfast lecture series. 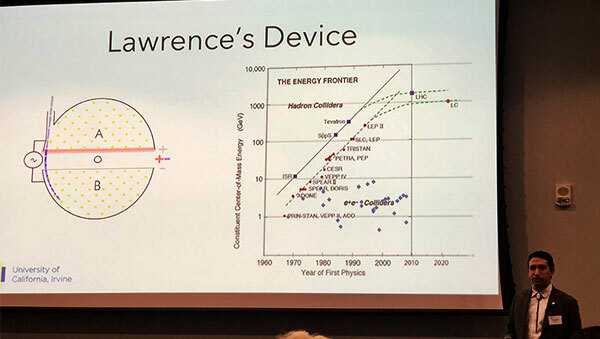 He spoke on "Bringing Moore's Law to Lawrence's Device: Miniaturizing the Particle Accelerator." His main thesis begins with a review of Moore's Law for semiconductors, where the number of transistors that could be fabricated on a chip has been doubling every two years since first identified in 1965. He then comes back to the main topic of the lecture, which is the required energy rating of particle accelerators, which has followed much the same type of power law. Check out the nearly straight line power law curve below showing the energy rating and the nearly doubling every two years or so. But the energy rating of particle accelerators has begun to plateau as evidenced by the dashed green line, which leaves the straight line and bends over and becomes saturated at the LHC energy rating. It may well be that the current energy rating of the LHC may not be high enough to find and verify physics beyond the current standard model of particle physics. How do you get more and more energy into the accelerators? It is going to be very difficult to keep building machines much bigger than the LHC. So, what to do? Dollar goes on to explain that the power rating of laser technology, which seemed almost to plateau in the 1985 timeframe, as indicated on the chart below, but that since then new technology advances have put the laser power rating on a high growth curve since then. You might not be able to make out the power intensity on the vertical axis, but it is shown as about 10 to the 15 watts per square cm in around 1985 and has been growing phenomenally and is projected to reach 10 to power 29 watts per square cm shortly. The growth in intensity from 10 to power 15 to 10 to 29 in say, 30 years, represents, to my back of the envelope calculation, about a doubling of laser power every 8 months. So, this rate is even faster than Moore's Law. The increasing rate began with a new approach called CPA (Coherent Pulse Amplification). This technique puts more and more energy into very short pulses and gets high power density. This high power density is so intense that it can fully ionize atoms and create intense electric fields as the fast moving electrons move away from the sluggish protons. Ok, but so what, what if the laser power is increasing at that rate; how do we use it? Professor Franklin identified many applications where intense radiation beams can be generated by this approach with accelerators much smaller and less costly than conventional devices. These accelerators are to be used in imaging and radiation therapy and should enable much lower costs to the patients. But, will the technique work in particle accelerators like at the LHC? It is not clear how much improvement will come in this area because at the LHC it is not just the power density that is critical but the beam strength and getting higher beam strength with this approach does not scale well. 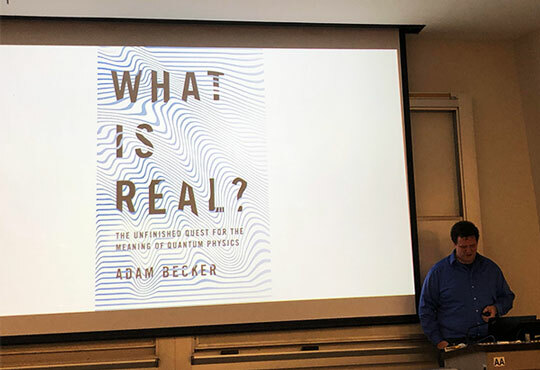 Lastly, the UCI Physics Colloquium this time was presented by Adam Becker, author of the book, "What is Real? ", and his topic was "The Trouble with Quantum Physics and why it Matters." His presentation also covered some of the spooky action at a distance apparent in quantum mechanics. He went on to mention some of the common interpretations of quantum mechanics, like the Coppenhagen, Bohmian, Bayesian, and Everett's many worlds, interpretations. All of these interpretations are consistent with the experimental evidence for quantum mechanics, and each has its own little group of adherents. So, what are we to make of this ongoing different sets of interpretation? Becker provided a defense of different interpretations where each offers different perspectives on how to go forward. There is disagreement now on the foundations of quantum mechanics, but some time in the future as a more inclusive description of reality, something like the theory of everything or of quantum gravity, we will find that one or maybe none of these interpretations makes more sense. My takeaway from the presentation is that our own interpretations help keep us focused on what types of questions to ask. There might not be any test condition available now to differentiate between various interpretations, but the physics beyond the standard model, when and if it comes, will help answer the question. This also applies to models like string theory, which do not have any evidence available to tell if they are on the right track or not, but the truth is that these ideas focus the energy of researchers now and drive us forward toward the next theory. So, string theorists, and others, keep pushing forward. We want a more integrated theory of everything and we can wait for experimental verification! 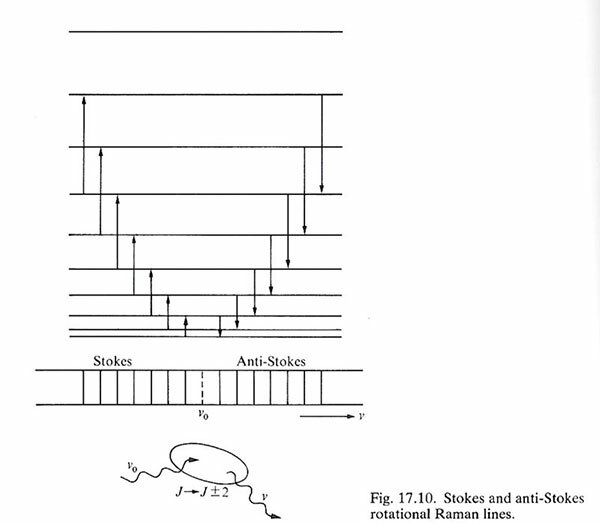 Becker did not talk about the example illustrated below, which was taken from his book, but it again continues with the overall theme of the spooky nature of quantum mechanics. This diagram shows a setup with incoming photons from the left and two detectors on the right. In between, we have a combination of mirrors and beam splitters, which makes up this interferometer, where the path lengths are the same. Now the weird effects start to show up when we decide to include a 2nd beam splitter or not. 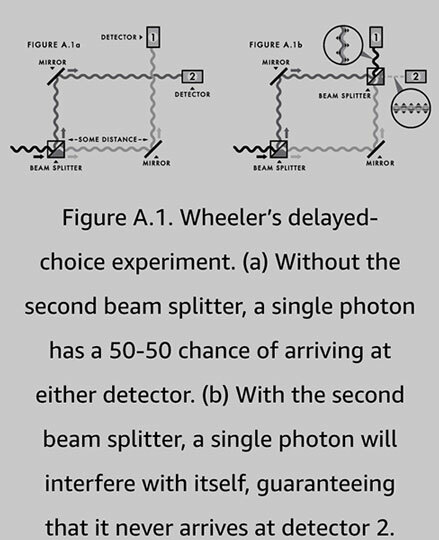 Without the 2nd beam splitter, number of photons reaching Detector 1 or Detector 2 is identical. This is just exactly what we would expect using classical physics and also exactly what quantum mechanics predicts. Now the fun starts when we add the 2nd beam splitter. Classically, you would not expect that the 2nd beam splitter would result in zero photons now reaching detector 2. The quantum explanation is that now the single photon interferes with itself, after going down both paths, which results in zero photons getting to detector 2. Pretty strange, but that is the answer you get if you set up the calculations and that is what you measure if you do it in the lab. So, in one sense, we just need to "shut up and calculate" (This quote often attributed to Feynman, but probably more accurately to David Mermin) and in another sense, we wait for insights gained from these observations and interpretations to generate that very real "aha" moment in some foundations of quantum mechanics investigator, which brings us a more fuller, deeper interpretation. The book "What is Real?" has this an other examples of spookiness and is an easy read. Ok, that is the summary of these events. If you are interested in more of the details, just check out any of the referenced sources.